Heat grill. Cut four 18 x 12-inch sheets of Reynolds Wrap™ Heavy Duty Foil; spray foil with nonstick cooking spray. 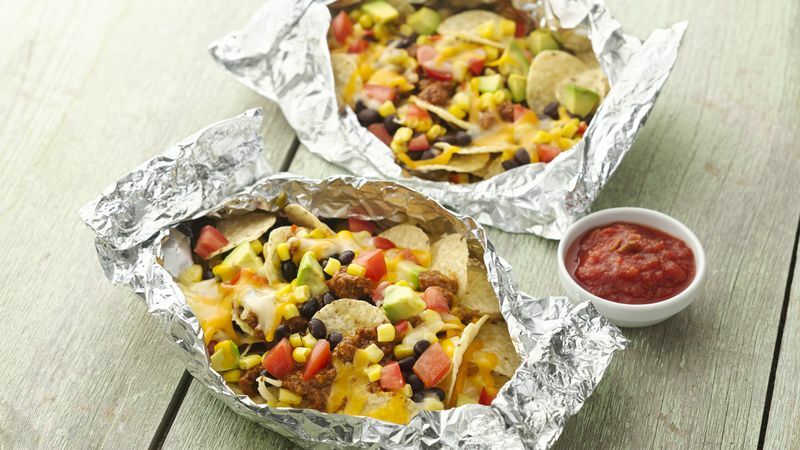 Spread tortilla chips in center of each foil sheet. Spoon ground beef in taco sauce evenly over chips. Sprinkle all remaining ingredients evenly over beef mixture. Wrap each packet securely using double-fold seals, allowing room for heat expansion. When ready to grill, place packets on gas grill over medium heat or on charcoal grill 4 to 6 inches from medium coals. Cook 10 to 15 minutes or until cheese is melted and toppings are thoroughly heated. To serve, carefully open each packet to allow steam to escape. To bake packets, place on large cookie sheet; bake at 375°F. for 15 to 20 minutes.